It has been almost 2 weeks since my last post. Life shows up and it becomes necessary to take care of the responsibilities at hand. I am grateful that people notice and care enough to inquire. Thank you that really means a lot to me. You made my day. I remember in my active addiction no one cared if I wasn’t around. If they didn’t see me it was a relief. I know that I caused it to be that way. I accept my part in the damage and mistrust that resulted from my addiction. I know that it can take a day or a life time for forgiveness from others. I accept that as well. I am more concerned with forgiving myself right now. All else will eventually fall into place. Right now I am working on me. Changing the old reckless attitudes and behaviors that were associated with my active addiction. I have accepted the truth. The fact that my life was in shambles, unmanageable and down right out of control. But that was then. Today I am a different person. 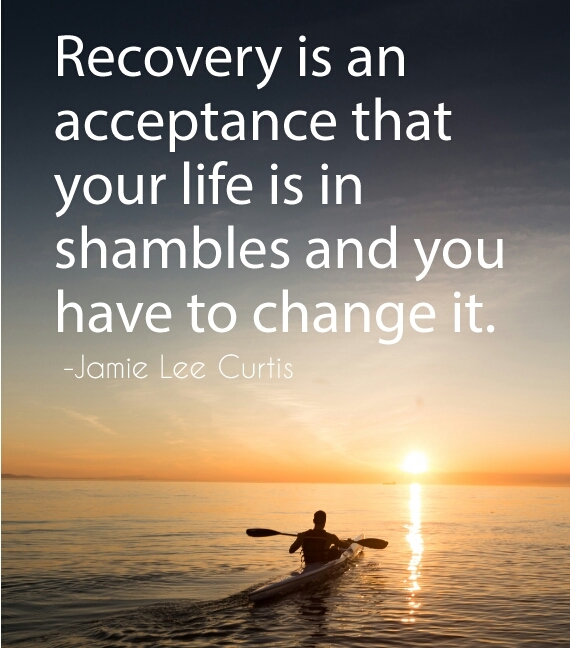 I am actively participating in my recovery and make changes is a major part of learning to live life without the use of drugs. No one said it was going to be easy. But no one said that it can’t be done either. I know for a fact that it can be done because I am doing it. It has been a journey full of ups and downs. Thinking that life is always going to be easy and good is a expectation that will set me up for certain failure. Accepting the truth that life will show up allows me the opportunity to deal with it, learn from it and grow. Change is about growing. Putting on my Big Boy pants and taking responsibility. Not running from it and thinking it will go away. Recovery has afforded me many opportunities but the biggest and most important one for me is the opportunity to change. This entry was posted in 2015 and tagged acceptance, addiction, change, recovery. Bookmark the permalink. You are a great spokesperson and role model to others. I’m very happy you are in such a good place in your life. Thanks I appreciate that. Have a fantastic day. Thank you Juan. I am doing great. I appreciate your concern. Have a blessed day. Hey Eric: it is good to see you posting again. I have missed seeing your wise words on here, thought I need to write and see how Eric is doing, but I let time go by. I apologize. Thank you George. I understand, time has a way of getting away from us. I have been so busy. I hadn’t had time to post and next thing I know it’s been 2 weeks. Lol. Thank you my friend. Have a fantastic day. Glad to see you posted I was just thinking yesterday you had been silent for a while. Hope everything is going good! Thank you Gary. Everything is going great. I cannot complain. I am grateful. Praying that all is well with you also. Have a blessed day.